Its model number and name are #006 / White Tiger. Character Bio - When Hector Ayala found the Amulets of Power in a New York City alleyway, he could never have known the family legacy he'd leave behind. Hector was the first White Tiger, and upon his death, his niece Angela del Toro donned the mantle. She, too, was killed in action, and so the Amulets fell to Hector's younger sister Ava. A skilled martial artist even without them, the Amulets provide her with enhanced speed, strength, and agility, and her skills have earned her a spot on no less than three Avengers rosters. Even so, Ava feels the weight of her legacy on her shoulders, and knows better than most the risks that come with heroism. Unfortunately, her predecessors never mentioned the ancient tiger god that imbues the Amulets with their mystic powers - a god hungry for bloodshed and a scion to serve it. As a Human, White Tiger has these Human Synergies. As a Crime Fighter, White Tiger has these Crime Fighter Synergies. As a Human, White Tiger interacts differently with these special powers. As a Crime Fighter, White Tiger interacts differently with these special powers. Last edited by japes; April 22nd, 2018 at 02:59 PM. -When White Tiger attacks with a normal attack, all blanks rolled count as extra skulls. -When White Tiger defends against any attack, all blanks rolled count as extra shields. -After attacking with White Tiger, roll the 20-sided die. If you roll 16 or higher, White Tiger may move up to 2 spaces and attack again. White Tiger never takes falling damage and is never attacked when leaving an engagement. After rolling attack dice for a normal attack or after rolling defense dice, for each shield rolled you may immediately move White Tiger one space up to 6 levels up or down. When defending against a non-adjacent attack, White Tiger adds one automatic shield to whatever is rolled. Starting off with Johnny's suggested wording for Possession but I think it may need to be adjusted down to counting blanks instead of doubling skulls. No real target for points. 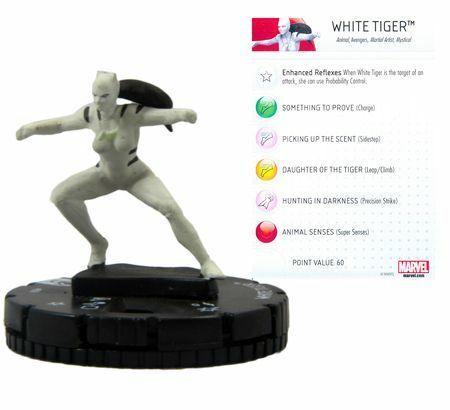 When you roll defense dice for White Tiger against a normal attack from an adjacent figure, one shield will block all damage and she may immediately use her Stealth Leap special power. Last edited by japes; February 21st, 2018 at 10:08 PM. If you roll 16 or higher, White Tiger may move up to 2 spaces and attack if possible. The 'may' statement makes it sound optional, but then the 'if possible' statement generally is attached to mandatory effects. So what is the intent here, that she must move and attack again as if she is out of control or that she may move and attack again as if she is in control? On points, currently she looks a lot higher than the 130-150 range. Double skulls and double shields with 4/4 stats before Starlord/CA get involved makes her pretty scary if you don't have an auto-wound power for those last two wounds. Double only when she has exactly 3 or 4 wounds. Something I reckon will not be for an extended period of time any game. Works a lot like the mechanic that shuts down Dimensional Teleport for the DJs. I like it. Yeah, there's a little must/may confusion going on in White Tiger Possession. I think the multi-attack part should be a 'may' power. I don't remember her ever freaking out and attacking allies or anything. I think blanks as skulls/shields is probably going to be more on-target for points than double-shields/skulls. She'll definitely be a good pick for a Cap/Cage build. Last edited by Ronin; November 30th, 2017 at 08:24 PM. As stated in the other thread, happy with this direction. Could definitely tweak the actual mechanics of the Possession up and down depending on how hard we want her to hit - as long as she's mid-100s I think she'll be fine. mid-100's is where I'd like to see her fall. Fits her well into a Luke Cage build. I changed the attack bonus to counting blanks instead of doubling skulls. If it plays week we can always go back. I changed the attack bonus to counting blanks instead of doubling skulls. If it plays week we can always go back. Also looking for suggestions for personality.